Katie Korein appears in the "Ladue News". In June 2006, Katie Korein won NaturallyCurly's Curl Pride contest, a national essay contest that asked kids to tell us why they needed a curly makeover. Her essay was selected from hundreds of entries, and Katie and her family were flown in March to New York, where she received a makeover from "Curly Girl" author Lorraine Massey of Devachan Salon. 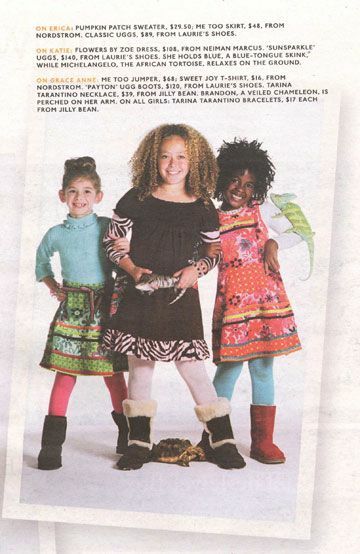 Fast forward to a fall fashion spread in the "Ladue News" in Missouri where Katie Korein is rocking her beautiful curls. "I was picked to do this modeling gig because of my great hair," Katie says. "I am hoping to do more modeling jobs in the future. I believe my hair will be my selling point." Andrea Korein, Katie's mother, says she has learned to work with her curls, and still relies on Deva products. Every week, she does a deep conditioner overnight, covering it with a plastic cap to soften her curls. "The experience really did change the way I feel about my hair," Katie Korein says. She no longer wishes for different hair, and she relishes the attention she gets every time she wears her curls out rather than back in the ponytail — a style she once relied on all the time. "She sometimes feels that people like to be around her because of all her curls," says her mom. "It is hard to put in words, but to sum it up, she loves her curls!" "This theory has not been scientifically tested yet," she says.